WASHINGTON — During his State of the Union address on Tuesday night, President Trump expressed a desire to “build a culture that cherishes innocent life,” and urged the passage of a bill that would ban abortions later in a woman’s pregnancy when children can feel pain. Reaction to his remarks have been mixed as some have denounced Trump’s words, asserting that his characterization of the New York abortion law was misleading, while others have said that his legislative goals should have gone further to outlaw abortion altogether. 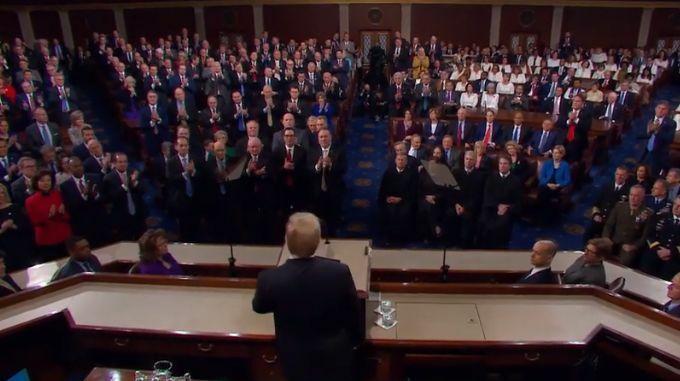 “I am … proud to be the first president to include in my budget a plan for nationwide paid family leave, so that every new parent has the chance to bond with their newborn child,” he declared, receiving applause. Trump then segued his comments about mothers and their newborns to the abortion bills that are the center of discussion in recent weeks. “There could be no greater contrast to the beautiful image of a mother holding her infant child than the chilling displays our nation saw in recent days. Lawmakers in New York cheered with delight upon the passage of legislation that would allow a baby to be ripped from the mother’s womb moments before birth,” he said. Trump was referring to the New York Reproductive Health Act that, as previously reported, not only enshrines the right to abortion in state law, but allows allows for abortion past 24 weeks—and without limitation—if the baby is not expected to survive or in instances deemed necessary to “protect” the life or health of the mother. A number of OB/GYNs and nurses nationwide have also spoken out on such concepts in light of the New York law, stating that an abortion is never necessary for the health or life or the mother as an emergency C-section will be performed instead in an effort to save both mother and child. “These are living, feeling, beautiful babies who will never get the chance to share their love and dreams with the world,” Trump commented on Tuesday. The Republican half of the room rose to their feet in cheers, but those on the Democratic side largely remained seated. New York Gov. Andrew Cuomo released an op-ed on Wednesday accusing the president, along with the “religious right,” of purposefully lying about the abortion bill that he signed into law last month. “But these objections aren’t about the rare occasion when a woman has an abortion to protect her health or life. This is about the desire of Mr. Trump and allies on the right to outlaw abortion entirely. It is about bringing America back to the pre-Roe days,” he said. “Restrictions on abortion later in pregnancy prevent health care providers from giving their patients the best care possible. I trust my patients; I trust women,” tweeted Leana Wen, the president of Planned Parenthood, in response to the president’s words. Others opined that Trump should have gone further with his goals and condemned all abortion, not just those instances allowed later in the pregnancy due to the mother’s health—which have been refuted as not necessitating an abortion, but rather a C-section. “Allow us to translate: ‘To defend the dignity of every person, I am asking the Congress to pass legislation to prohibit the murder of only some people, based on arbitrary, discriminatory criteria,'” wrote the organization Abolish Abortion North Idaho. “If the fact that [the baby] can feel pain is the reason used, then why not simply give the babies anesthesia first prior to killing them? The fact that a baby can feel pain is not the reason it should be illegal to murder them by way of premeditated abortion (the planned homicide of unborn babies),” the Facebook page Pro-Life Rocks also remarked. Some said that while they wished the president sought to completely end the murder of the unborn, they commended Trump for at least speaking out on the subject.